I simply adore this gorgeous bathroom designed by the team at Maddux Creative. Exuding elegance, timelessness and luxury, this stunning bath is the epitome of classic beauty. 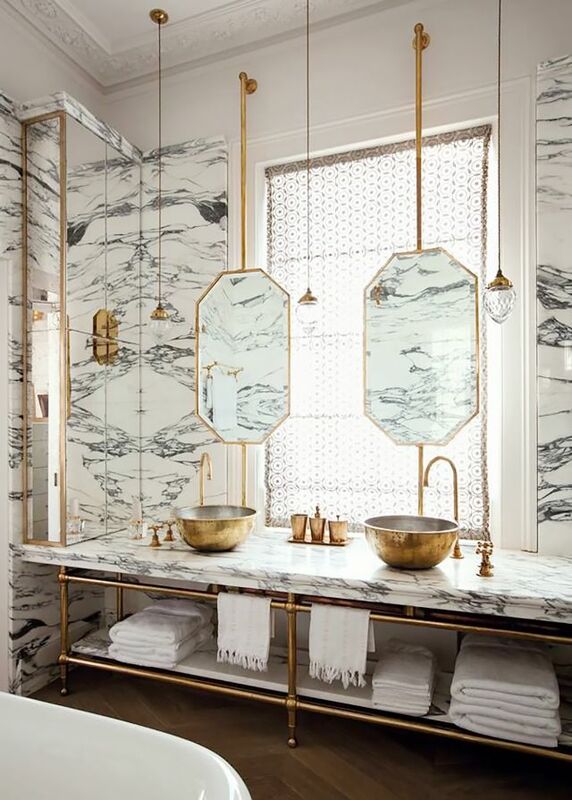 The beautiful marble and the chic brass elements definitely make this room shines! The octagonal floating mirrors, on the other hand add a feeling of weightlessness in the space. Meanwhile, the mirrored cabinets provides additional storage and reflect light, making the space look bigger and brighter. The charming glass pendant lights are decidedly simple to avoid fighting with the bold octagonal mirrors and marbles visually. The classic herringbone wood floors provide warmth and a wonderful balance to other "colder" elements. Chic, elegant and visually delightful, what's not to love about this splendid bathroom? Your thoughts? Yummy I love this room!